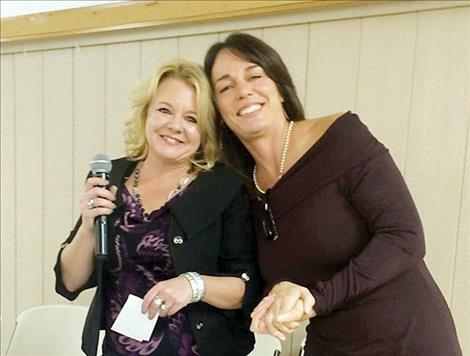 Launa Benson, left, helps DeeAnn Richardson, SAFE Harbor executive director, secure a Mary Kay $20,000 grant. RONAN — Improving the lives of others was always a priority for Mary Kay Ash, the founder of the international corporation that bears her name. Nearly two decades after her death, the vision of this pioneering businesswoman continues to have a positive impact on families from across the country. As part of National Domestic Violence Awareness Month, the Mary Kay Foundation recently selected SAFE Harbor as the recipient of a $20,000 shelter grant. Since its inception 20 years ago, the Foundation has invested $38.6 million in its annual shelter grant program. “Mary Kay had a concern for others and left an amazing legacy through her foundation,” said SAFE Harbor Executive Director DeeAnn Richardson. The funds are provided on an unrestricted basis, meaning organizations can apply them where they are needed most. The fact that shelters across the country can use these unrestricted funds to best fit their immediate needs has often made the difference between keeping the doors open or closed, helped maintain a critical service or provided a life-saving safe place for a family in need. To apply for the funding, shelters partner with a local Mary Kay consultant in submitting a proposal. Each year, the Mary Kay Foundation awards a grant to at least one domestic violence shelter in every state. SAFE Harbor was Montana’s only recipient this year. Any remaining funds are distributed based on state population. Grant applications are reviewed by the Domestic Violence Shelter Grant Committee, which makes recommendations to the TMKF Board of Directors. After reviewing these recommendations, the Foundation’s Board of Directors selects the final grant awardees. This year, the Foundation awarded $20,000 grants to more than 150 women’s shelters across the United States for a total of $3 million.